Anak bulan if translated direct to the point in English means child moon or moon's child. It's weird to call anak bulan as child moon in English so don't call it child moon or moon's child anymore. Actually anak bulan or crescent moon known as hilal in Arab language. Anyway, I will call it anak bulan since it was used to be call like that in Malaysia. Before I tell you why this entry should be created earlier, let's find out places for moon sighting..
Bukit Pelindong, Kuantan di Pahang. Menara Universiti Malaysia Sabah, Sabah. I got information from anonymous that anak bulan can also be seen at Masjid Abu Bakar Johor Bahru and Muar, Johor without using telescope or binocular. Whether it's true or not I think I will look for anak bulan Syawal (first moon of Aidilfitri) at Masjid Abu Bakar or Muar to witness the truth. Not Seen: Zaki Afifi (MCW member) from Seremban reported: Attempted sighting on Sunday 31st July, in Seremban Malaysia. Location was not strategic and obstructed. Sighting as an act of taabbud. 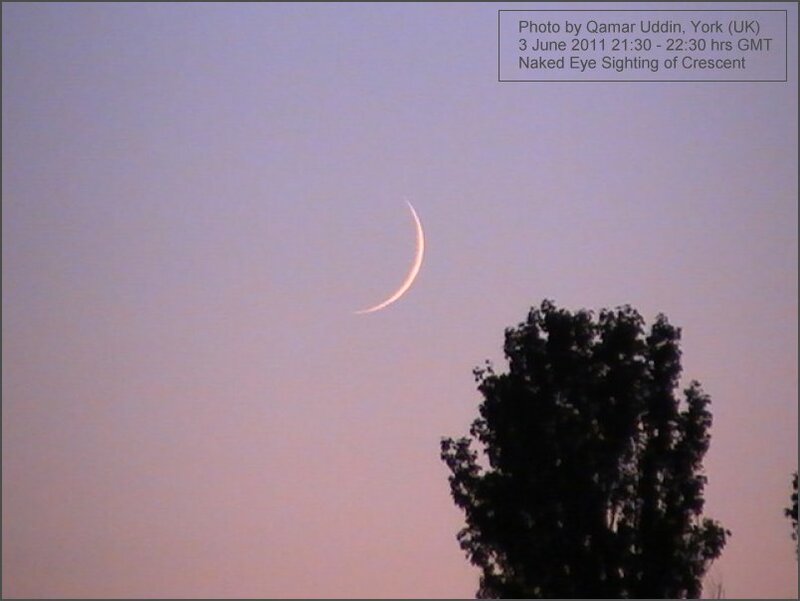 Hilal not sighted but the government has announced first day of fasting on Monday. 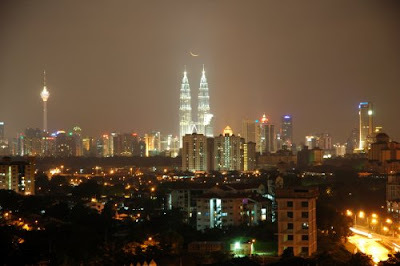 Not Seen: Firdaus Mazlan (MCW member) from Johor Bahru reported: On Sunday, 31th July 2011 M equal to 29 Sya’ban 1432 H, I with my friend (around 30 people) cannot see the new moon either with telescope or with naked eye. Our location at Baitul Hilal, Teluk Kemang, Negeri Sembilan, Malaysia (02:26:43.0 N , 101:51:16.0 E). My friends from other places like Muar (02:03:0 N , 102:34:0 E), Pontian Kechil (1:29:20.68 N , 103:23:08.60 E), Johor Bahru (1:38:0 N , 103:40:0 E), Kota Tinggi (01:44:0 N , 103:53:0 E) and Melaka (02:15:0 N , 102:15:0 E) also cannot see the new moon. However, our Government have announced the first Ramadan 1432 H on 1st August 2011 (Monday). How come the Government announced it on 1st August even anak bulan not seen on 31st July? How about you read another reports from Brunei and Indonesia. Not Seen: Dr. Mohammed Hussain Ahmad (MCW member) from Brunei Darussalam reported: The new moon was not sighted in Brunei Darussalam today 31st July 2011, Therefore the 1st Ramadan 1432 will start on Tuesday, 2nd August 2011. Not Seen: Ahmad I. Adjie (MCW member) from Bandung reported: I, Ahmad Adjie and team - Thoriq Gunara, Ridwan and Zahrah, from Bandung, Indonesia reports that today, Sunday 31 July 2011 Hilal was NOT SEEN in the northern hills of Bandung. There were patches of clouds but it would not have interfered with sighting. Same like sighting reports from Malaysia, anak bulan cannot be seen in Brunei and Indonesia on 31st July 2011. However only Brunei Government announced the first Ramadhan on 2nd August 2011. It is an advisory and consultation website, for use by Islamic organizations, Mosques, and Hilal Committees in deciding the start of Islamic months based on possibility of anak bulan sighting. This website is not in the business of making, implementing or dictating decisions on the start of Islamic months. It also reports actual sighting info from all over the world as they are received. MCW (Moonsighting Committee Worldwide) members are individuals who try to observe the anak bulan, because they understand the importance of moon sighting.They observe not only anak bulan for Ramadhan and Syawal but ALL the Islamic months. Advertisement : Controversy or unControversy ? Google Adsense in Malay ? Krisis minyak masak di Sabah!! !